This Loganberry Wine Recipe can be adapted to give the sweetness you want in the final wine. For a dry wine use the smaller amount of sugar and loganberries and for a medium-dry the higher. Loganberries are a cultivated berry from the blackberry family that was discovered in the USA. They are a delicious berry tasting and looking like a cross between raspberry and blackberry so it may be tricky keeping enough back for wine! 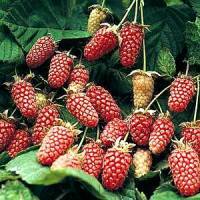 There is information on how to grow loganberries on the Allotment Garden website. Strip the loganberries from the stalks and wash well. If you place the berries in a bowl of cold water, any insects or maggots hiding will float out. Put into a fermenting bin and crush. An old-fashioned potato masher is great for this. Pour on 4 pints of water. Add 1 Campden tablet, crushed and dissolved in a little warm water. This will kill off any wild yeasts. Boil all of of the sugar in 2 pints of water for 2 or 3 minutes and, when cool, mix into the pulp. Add the yeast and yeast nutrient and cover and allow to ferment for 7 days, stirring daily. Strain and press and return to a clean fermenting bin. Leave covered for 1 or 2 hours and then pour carefully into a gallon jar, leaving as much deposit behind as possible. Fill up the jar with cooled, boiled water to where the neck begins. Fit a fermentation lock and leave until fermentation has finished. Rack, as necessary, and add 1 Campden tablet after the first racking to stop any secondary fermentation. Makes about 1 gallon of delicious wine that is full-bodied and warming in winter, holding summer’s warmth. Usually it’s quite drinkable after a few months and exceptional after a year in store.